It’s human to take the most common things for granted. For an event professional, banners are one of those things. And they shouldn’t be. If you’re managing an outdoor event, banners are your public face; they speak quickly and loudly about what kind of operation you’re running. With the proper level of attention, a simple banner can look sharp, almost indistinguishable from a hard sign. Questions like this point to the need for level of involvement in your event that most printers don’t address. How are products like banners being used in the field? What conditions dictate finishing or materials solutions? There is no “standard” size. While the most common material is 13-oz PVC-coated scrim banner material, size is completely a function of need. That said, size can help determine what material should be used. Sewn or “heat-welded” hems, plus grommets, represent the most common finishing solutions. Pole pockets are required in some situations, as is Velcro. If you’re using Velcro, it should be sewn into the hems, not applied with self-adhesive backing, which will almost invariably fail, probably right in the middle of your award ceremony. Some smaller shops without welding or sewing equipment use adhesive hemming tape instead. In my experience, it’s a poor substitute and should be avoided. In case you’re wondering, banners haven’t come with ropes through the hems since some time during the Middle Ages. A banner will most likely fail at the grommets, so reinforcing the hems with webbing (similar to the material used for backpack straps) is the best way to ensure that a banner will hold up in the wind. This belies the widely held belief that a heavier banner is stronger. That’s possible, depending upon the character of the scrim (denser weaves are stronger, yielding higher tear and tensile strengths) but in many cases, heavier is simply a matter of more PVC, not a dramatically stronger construction. The added weight can actually put more strain on the grommets relative to the additional tensile strength of the material. Installation is important too. Banners should be tight, not only because they look better, but because a loose banner will tend to flap back and forth in the wind and place added stress on hems, grommets and the material itself. 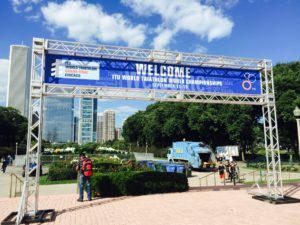 There are many good reasons to use heavier banner material (think of a Cirque du Soleil tent), but event signage is usually not one of them. As a rule of thumb, your most serviceable and cost-effective solution is a solid-quality 13-oz material. If you run into problems with tearing, it’s likely your vendor is using cheap, low-tensile-strength fabric — and probably charging you too much to boot. Find a new vendor. If you’re contemplating the need for wind-slits, note that most (if not all) manufacturers recommend against them, and will not honor warrantees on banners that are compromised by cuts or slits. Personally, I’ve always considered a banner with wind slits akin to hanging an old rag. I prefer webbed hems, with wind slits as a very last resort. Some banner material comes with an integrated light-blocking layer, allowing the banner to be printed on both sides, without having the image from one side bleed through to the other. Appropriately, this is called “block-out” banner material. If you need a double-sided banner, this is the way to go. Block-out material finishes the same as the normal stuff. Unless you have no other alternative, you should not accept two banners, sewn back to back, as a substitute for block-out material. It’s not “just as good,” as some vendors are apt to tell you. Not even close. Mesh banners are great for larger applications, where weight is more of an issue. Most mesh banner material weighs just 7-8 ounces per sq. yard, although it’s quite strong, and can be finished with web-reinforced hems. If there is a chance that a banner will be backlit, mesh material is NOT a good solution. Nor is mesh a panacea for windy environments. It helps, but most event mesh stops 70% of the wind (the term in this case would be “30 percent blow-through”), so a line of unsecured fencing covered with mesh will still come down like a row of dominos in a strong gust. It’s common knowledge that banners need to be rolled, not folded. But even rolled banners tend to flatten and crease. Your best bet is to roll them on a core, or rigid tube, for long-term storage. The tube should be at least as wide as your banners, plus a bit. Where do you find cores? Try 3” or 4” white PVC drainage pipe at Home Depot or Lowes. The stuff is dirt cheap, and comes in long lengths that can be easily cut to size. And it’s PVC so your banners will feel right at home. Be careful not to crease the banner during the rolling process. Last but not least, that dank, funky odor of mildew emanating from your storage unit or warehouse is a sure sign you’ll be ordering more banners. Never, ever, store banners when they are wet or even marginally damp. Dry vinyl is happy vinyl.